Anne Katrine Senstad's interdisciplinary practice has since the mid 90’s crossed photography, video, neon sculpture, immersive and site specific installations. 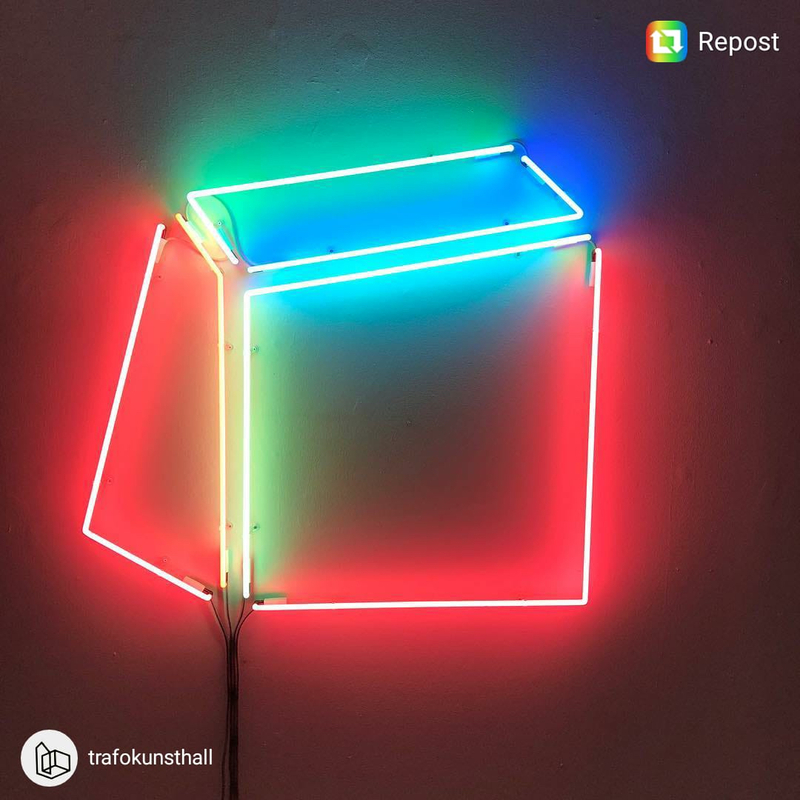 Her work has throughout her career been focused on the phenomena of perception and the sensorial elements; light, color, sound with a consideration for color theory, science and technology. Neon light occupies space with a natural enveloping softness and emotive language inviting the viewer into subliminal ways of perceiving the object through the essence of light and color. 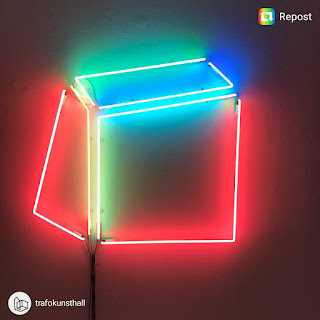 Her multiple forms of light installations are ways of working with and understanding spatial relations in terms of the psychological space, by seeing, observing and controlling suggested perceptions of the sensorial elements. In the neon sculpture series Soft Geometry, Senstad begins by transposing a space inhabited by light from her video projection installations Color Synesthesia I-VII, 2005 – 2015, (Synesthesia is a perceptual phenomenon in which stimulation of one sensory or cognitive pathway leads to automatic, involuntary experiences in a second sensory or cognitive pathway). The space is then outlined as a potential object through line drawings based on Senstad’s cognitive interpretations. 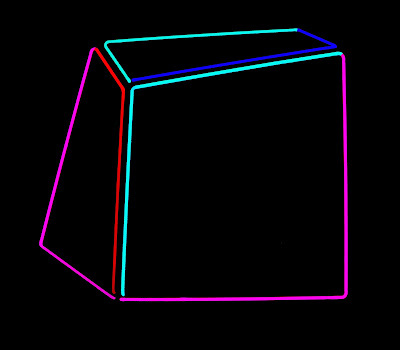 As the projected colors shift through hues over intervals of time, the form of the imagined object changes, from squares to triangles, where its own essence exists as pure potential, towards synthesis. These forms create illusions of space, mass and object. The light-line drawings she creates are flat, but illuminate space dimensionally through optical illusion. 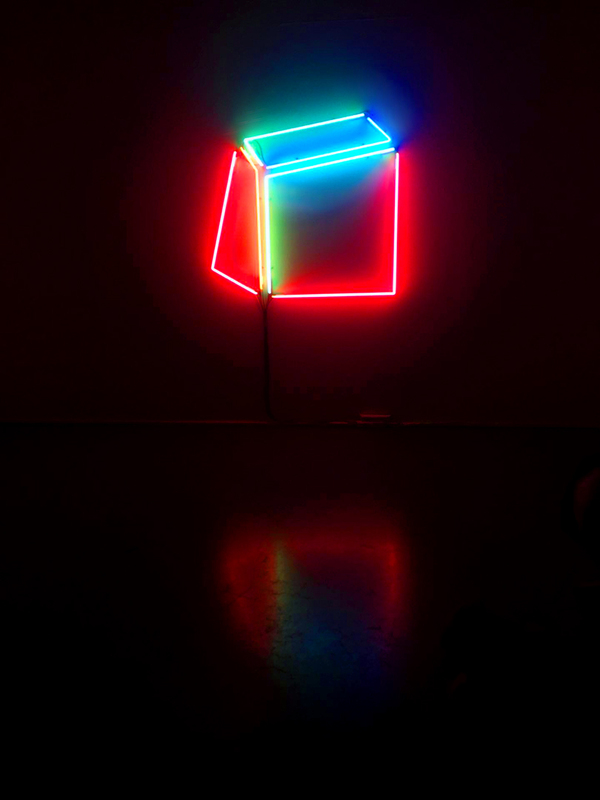 The origin of the geometric form is light, captured and impregnating a space, to navigate itself into suggesting solid form that becomes the Soft Geometry neon sculptures. New York based Norwegian artist Anne Katrine Senstad was educated at Parsons School of Design and The New School for Social Research in New York. Notable exhibitions include her controversial In Absentia exhibition Topologies for a Vertical Sound with composer C.C. Hennix - Displaced from the Void Rooms of Centro Culturale Don Orione Artigianelli during the 57th Venice Biennale, her solo show The Vanity of Vanities at El Magazen Dell’Arte during the 56th Venice Biennale, and UNIVERSALS at Officina Delle Zattere, Collaterali Eventi 55th Venice Biennale. In 2015 she produced a 90 ft long text based LED sculpture commissioned by the Bruges Art and Architecture Triennale in Belgium entitled Gold Guides Me(Capitalism in the Public Realm). Public art commissions include with architecture firms Snøhetta, at The Wolfe Center for the Arts, Ohio and TWBT Architects, Penn State Engineering Building. Her work is represented in private, corporate and institutional collections. ​Senstads mangefasetterte kunstnerskap har siden midten av 90 – tallet beveget seg mellom fotografi, video, installasjon og neonskulptur. Arbeidet hennes tar for seg fenomenologien ved persepsjon med en fokus på sanseopplevelser hvor hun vektlegger fargeteori og de okulære og soniske erfaringene. Gjennom Senstads lysinstallasjoner finner vi en måte å arbeide på for å forstå romlighet med psykologi som bakteppe. Dette gjør hun ved å ved å observere og kontrollere sansninger av elementene. Neon fyller utstillingsrommet med et naturlig mykt lys, i et følelsesladet språk som lar betrakteren oppleve objektet gjennom lys og farge. I neonskulpturserien Soft Geometry tar Senstad utgangspunkt i en videoprojeksjon av verket Color Synesthesia VII som skaper et lysfylt, mettet rom bestående av bevegelige farger og lyd. Synesthesia er en tilstand hvor stimulering av et av sanseorganene leder til automatiske eller ufrivillige sansinger i en av de andre sansene. I dette åpne, fargelagte rommet plasserer Senstad det geometriske lysobjektet. - Når de projiserte fargene skifter nyanser over tid, endres formen til det imaginære objektet fra firkanter til triangler, hvor essensen av hver form eksisterer som et potensiale til å forme en syntese. Vi har en optisk illusjon av rom, masse og objekt. 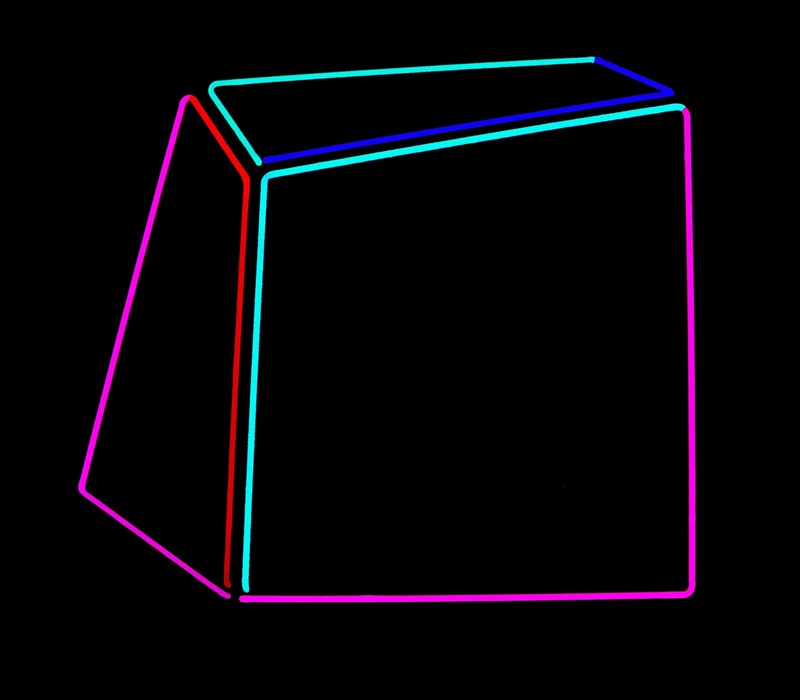 Her er utgangspunktet for den geometriske formen, den fødes i lyset, betraktes og redefineres i Soft Geometry, forteller Senstad. Anne Katrine Senstad (1967) er utdannet ved New School for Social Research, Parsons School of Design i New York og Berkeley University i California. Hun bor og arbeider i Oslo og New York. Hun har utført utsmykningsoppdrag for Snøhetta New York og Todd Williams/Billie Tsien architects. Tidligere utstillinger er bla Bruges Art and Architecture Trienniale, Veneziabiennalen i 2013, 2015 og 2017, Athr Gallery i Jeddah, Elga Wimmer Gallery, Bjørn Ressle Gallery og Gary Snyder Gallery i New York, Good Children Gallery og Prospect 1 i New Orleans, Bærum Kunsthall, Kunsthall 3,14, Utsikten Kunstsenter, K4 Galleri og Shoot Gallery. Hun er innkjøpt av Zendai MOMA og en rekke privatsamlere.